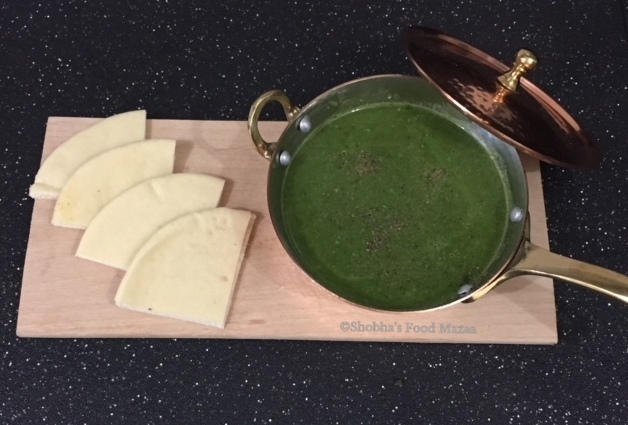 Palak ka shorba is an Indian version of spinach soup. The flavours of whole spices added while cooking give a lovely taste to it. Spinach is loaded with nutrition which makes this soup the most healthiest one. For variation sometimes people like to add tomatoes or lentils to it. You may also add milk or cream to it. Vegetable stock or water .. as needed. 2.Tip in the back cardamom, cinnamon and bay leaf. 3. When they give out an aroma add the ginger garlic followed by diced onion. 5. Add the spinach and salt. 6. Stir fry for a minute and add cumin powder 2 cups of vegetable stock or water. 7. Simmer to cook for about 8-10 minutes. 8. Discard the whole spices and blend the shorba. 9. Adjust the consistency to your liking. 10. You may add cream at this stage if you like. 11. Garnish with black or white pepper powder before serving. Healthy and a good one! Healthy and iron rich shorba, just love this kind of healthy soups for my winter dinners. Catchy and inviting shorba. Healthy and delicious shorba. You are right its like soup. It can be serve hot as iron rich soup. Superb share. Loved it. Very healthy soup. I do try to make different spinach recipes at home, not all go well, some time, I was very hesitant when I tried this soup first time. But the end result came out pretty. It's so perfect for winter. Yes dear, sometimes the recipes come out unexpectedly well. That's one lovely soup, I make spinach soup but giving it an Indian flavor is a good suggestion. Will have to try it. Must try it and share the feedback if you liked it. Such a healthy and flavourful soup !! Perfect soup for winter.. Great share. Gr8 idea of adding different veggies.. the variations are endless. Yes Ritu, specially to our Indian taste buds. Thank you so much Soma.. your complimenting words really mean a lot to me. Delicious and nutritious soup ! Love the vibrant Color and recipe sounds great ..thanks for the lovely share . seriously this palak shorba looking very comforting. Palak taste awesome in soups in winters. True dear.. and such a healthy option too. This shorba will be ideal during winter and the season is apt now. Would love to try this one. Sure.. make it and enjoy dear. We love spinach, so this dish is right up my street. Healthy and filling! Simple and a hearty meal! Lovely recipe! Yes.. I love them in winter too. Such a healthy and yummy soup.Love the green colour of the soup.Perfect for wet weather here.Superb share.